A Technical Exhibition of up to 100 stands is envisaged and will be held from Monday 16 to Friday 20 May in Exhibition Hall 1. The Technical Exhibition is an ideal opportunity for organisations to promote their services to a large international group from the water sector. The Registration Desk, Symposium Poster Sessions lunches and refreshments will also be in the Exhibition Area thus increasing potential contact with Exhibitors. The Exhibition area will also be utilised for as a hospitality centre for Accompanying Persons. Internet facilities will be available in the Exhibition area. Registration fee per extra exhibitor is ZAR 11 300 and includes all social events, lunches and refreshment breaks and access to the exhibition area. 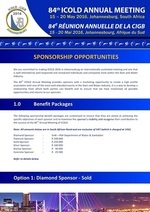 Click here to view all the sponsoprship packages available.